Vcards can contain phone numbers,email addresses,photos and even audio clips. Although vcards can be used for transferring email contact information the vcard format is also used by Customer Relationship management (CRM) systems,PDAs etc. Vcard files are text files that use the .vcf file extension.You can open and edit them in a normal text editor like notepad. 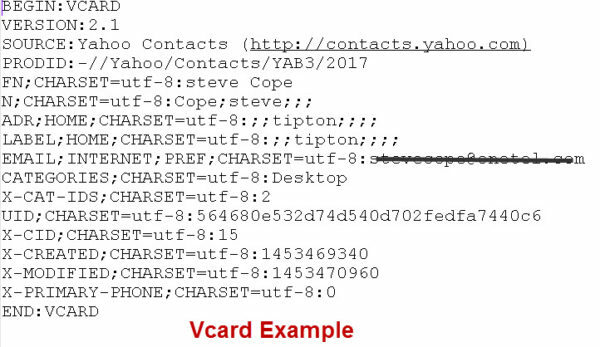 Here is an vcard file example taken from a Yahoo mail export. All vCards start with BEGIN:VCARD and end with END:VCARD. They also must contain the VERSION property, which comes immediately after BEGIN. See the wiki for more format examples. Add your own contact details to your contacts. 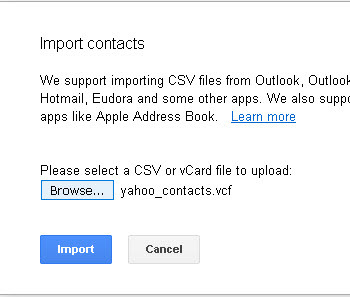 Export the contact as a Vcard. You should note that some email clients like Yahoo Mail don’t let you export individual contacts but will export the complete address list. The screen shot below shows the Yahoo Vcard export. If you use the ZIP format then you can extract the individual vcard from the zipped file. Vcards are usually exchanged by attaching them to an email. 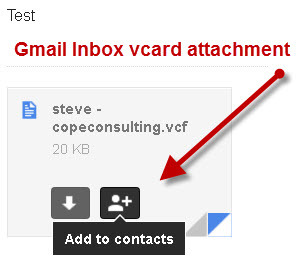 Some email client recognise a vcard attachment and let you add the contact directly to your contact list as shown below with Gmail. If you email client doesn’t support this then you will need to download the attachment and then import the vcard. 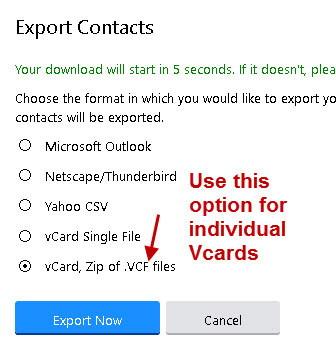 There are many online tools that can be used but the easiest option is to use an email App or client that will let you import vcards and export as csv. 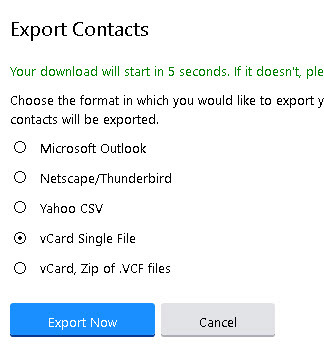 On Yahoo export contacts as a single .vcf file. Then go to Gmail and import the .vcf file. Now you can export them from Gmail as a .csv file. Q- Can I ad my vcard to my signature? Q- When exporting email contacts for transferring to another system should I use vcards or a .csv file? Q- Do I need my own Vcard? A- Personally i don’t have one, and have never received one. They are obviously used but not by most people. See this thread.